With adorable wrinkles and big bug eyes, it is very difficult to not love pugs. This ancient and popular dog breed is social and intensely loyal as well. It is believed they originated in China before 400 BCE. Some historians also believe that they are related to the Tibetan Massif. Since then they have evolved as a dog breed, especially after they were brought to Europe in the 16th century. 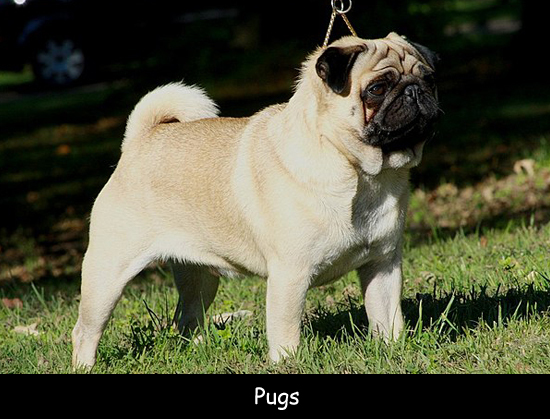 Pugs have one of the shortest snouts of all the dog breeds. This is also a reason why they cannot tolerate high heat and humidity. They sleep around 14 hours in a day which is way more than other dog breeds. Pugs are prone to eye injuries as their eyes are a prominent feature. They belong to the toy dog group which consists of all the smallest breeds of dogs. Pompey, a heroic pug saved the life of Prince William of Orange. After this, they became the official dog of the House of Orange. Queen Victoria was also a dog lover, especially pugs. Until the 1700’s, they had a different name, Mopshounds. A group of pugs is known as Grumble. Although they have short coats they still shed a lot of hairs. All dogs snore at times but pugs snore more often and also more loudly. They can overeat more quickly than other dog breeds and are prone to weight problems. You should not be surprised if you find your pug following you around the house as they always need a human companion. On average pugs can run at a speed of around 3-5 miles per hour. Wrinkles on their face need to be cleaned on a regular basis.